Our Silver Anniversary Harmony Heart has 25 beads: Celebrate your 25th Wedding Anniversary! This Harmony Heart design was created as a unique 25th Wedding Annivesary Gift. Silver is the suggested material for a 25th... and this solid Sterling Silver Harmony Heart pendant and chain were made for the occasion. The softly rounded heart (7/8" wide) comes with 25 silver beads. They gracefully accent the front, as well as form the bail (that the chain slides through). 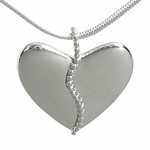 It comes with a sleek, sterling silver snake chain to set the piece off beautifully. "Thank you for having the exact gift I needed for our 25th anniversary. My wife is hard to shop for and this looks like exactly what I needed, excellent gift wrap, also.. Good luck! "- Bill B. "I put in an order and it came right on time as promised. As a result,this allowed me (a procrastinator) to be on time in giving my 25th anniversary necklace to my wife. A big thank you goes to ARCHITECTs Touch" - William D.
"Had some initial concerns because their jewelry was not sold in stores. I wanted to be able to see the necklace in person before buying it. I sent an email to them and they responded promptly. They assured me that if I was not satisfied, I could return the necklace for a refund. My wife liked the necklace and everything worked out great." - Bill W.